The lectures start at 5:45 pm in auditorium E (Hörsaalgebäude). They are given in German. The lecture series is open to all. They are free of charge and registration is not required. As part of the multi-term spanning series Art market: Research – fields of work – interdisciplinary dialogue, the lecture series is decidedly practice-oriented in this term, after the focus lay on the subject area research in the last two winter terms. Established experts from practical areas of the art market (i.a. auctioneers, art trade/gallery, art insurance, art logistics) will provide an insight into history, work flows and duties of their everyday working life. At the same time, they will address the specific challenges in their branch. 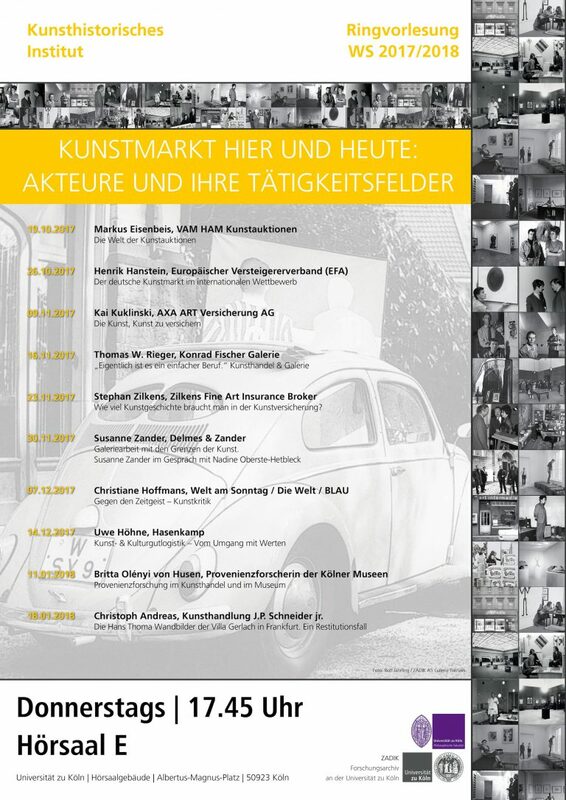 Reference: ANN: Lecture series: The Art Market of Today (Cologne, 19 Oct 17-18 Jan 18). In: ArtHist.net, Oct 10, 2017. <https://arthist.net/archive/16412>.